From Nikko Japan and on display at CES was this very interesting Skype phone that shares striking similarities with a Lightsaber. It doesn't have any kind of external energy beam, but it does produce the Lightsaber noise upon plugging into a computer. 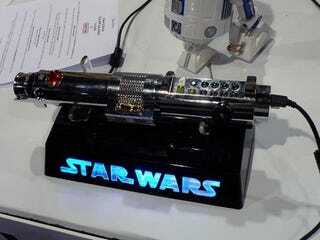 It even includes a very flashy stand that allows you to proudly display your Lightsaber Skype phone, right next to your virginity. Zing!